Stunt Siva's Legacy Gets Capitalized By The Golden "Duo"! The Entertainment joyed through the cinema is tailored by the sweat of many hardworking craftsmen. Stunt choreographers are the unique breed, who sow their blood as the seed to pull the high octane goosebumps from the viewers. Kollywood has witnessed many innovative stunt choreographers amongst them, Stun Siva's works are predominantly enjoyed by the action film lovers. The Kollywood myth of carrying the stunt "legacy" to the younger generation is once again justified here by Stun Siva's sons Kevin Kumar and Steven Kumar. 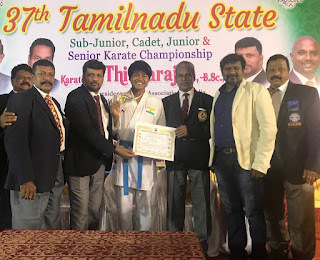 in which both Kevin Kumar and Steven Kumar triumphed the gold medals in 70kgs-Male kumite and 76kg-junior Male kumite categories respectively. Karate Thiyagarajan,The State head of the association honored the winners with the medals and certificates. The event was held from 10.1.2019 to 13.1.2019 in JJ indoor stadium located in Kilpauk, Chennai. The prestigious event had the presence of the Association secretary Mr.Kanagaraj, the treasurer Mr.Althaf Alam and the proud father Stun Siva.